Background: The glyoxylate shunt of fatty acid metabolism is critical to the survival of Mycobacterium tuberculosis (Mtb) during the dormant stage. The two enzymes of glyoxylate shunt pathway, isocitrate lyase (ICL) and malate synthase (MS), have been identified to be involved in Mtb persistence and become the attractive targets to intervene with the pathway. Methods: In order to search novel MS inhibitors, molecular docking in autodock Vina was employed for the first time to virtually screen Fragment-Like subset of ZINC database against MS crystal structure. Results: Total 11 candidates were screened out based on binding score, binding conformation, and structural diversity. Conclusion: The interaction mode analysis, binding affinity reassessment and ADME predictions of these candidates indicate they all can be treated as potential MS inhibitors. 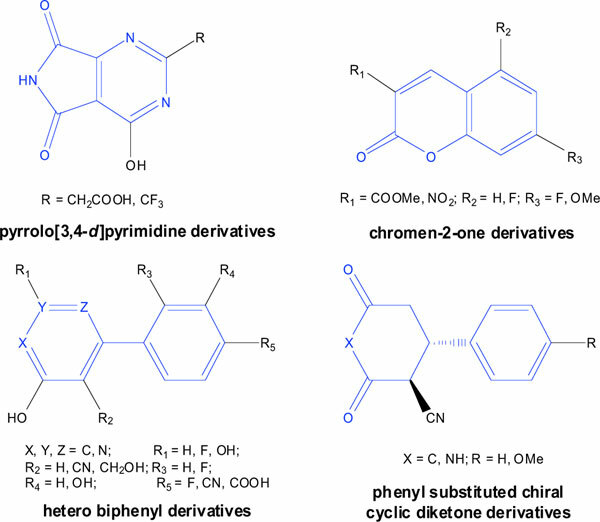 Their skeletons can be classified into four novel types, i.e., pyrrolo[3,4-d]pyrimidine, chromen-2-one, hetero biphenyl and phenyl substituted chiral cyclic diketone, which will bring an encouraging enlightenment to enrich the category of MS inhibitors and broaden their research scope. Keywords: AutoDock Vina, inhibitor, malate synthase, molecular docking, tuberculosis, virtual screening. Keywords:AutoDock Vina, inhibitor, malate synthase, molecular docking, tuberculosis, virtual screening. Abstract:Background: The glyoxylate shunt of fatty acid metabolism is critical to the survival of Mycobacterium tuberculosis (Mtb) during the dormant stage. The two enzymes of glyoxylate shunt pathway, isocitrate lyase (ICL) and malate synthase (MS), have been identified to be involved in Mtb persistence and become the attractive targets to intervene with the pathway.